This is the first album by the seiyuu group Drops. This package contains a CD and a DVD. The DVD contains around 45 minutes of dance lessons, rehearsals, backstage shots, and clips from the Drops 2nd single event (May 8, 2004). All of the songs on the DVD are the performances from the event. 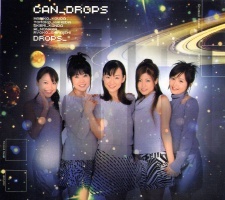 Drops are: Kouda Mariko (國府田マリ子), Kaneda Tomoko (金田朋子), Kanda Akemi (神田朱未), Nonaka Ai (野中藍), Shiraishi Ryouko (白石涼子).